Having developed a pretty serious tan from the warm climate of the country I was based at, I wanted something that could bring my skin back to its original fairness in a short time frame(well, since a tanned skin doesn't really suit my facial feature and I was desperate). 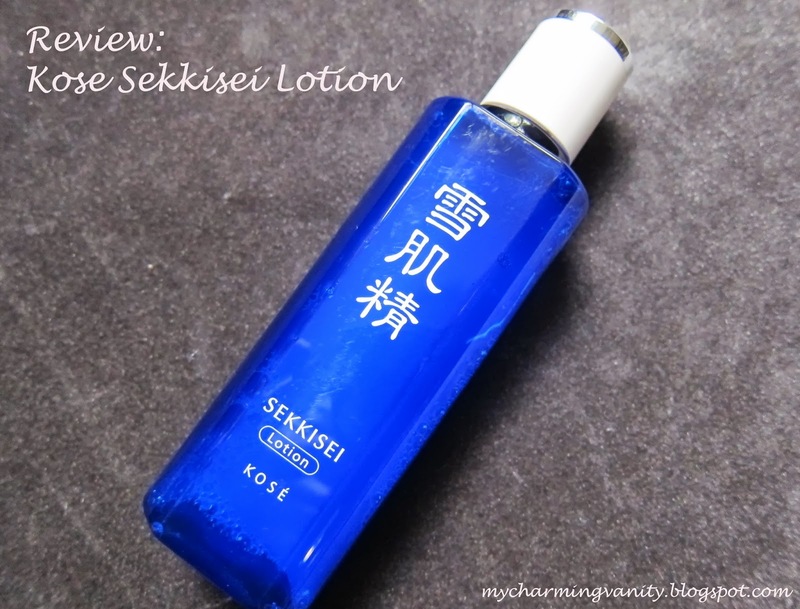 After hearing some rave reviews from several friends of the skin whitening benefits of the Kose Sekkisei Lotion, I decided to jump on the band wagon and bought the product while I was at duty free during one of my flights. The product comes in an off-white liquid format and is lightly scented with a floral scent. Whilst I typically have a preference for non-scented product, however, the scent of this lotion is pretty light and it doesn't bother me much especially as I only use it as a daily toner with a cotton pad (I do know that some people actually use this as a mask for extra boost by soaking the lotion on a sheet mask). In reference to the product claims, I would say that skin lightening is probably one of the most noticeable changes in my skin after using the product twice daily for about 2 weeks. I thought the result was pretty amazing as this is one of the very first skin lightening product I've tried which has given me noticeable results in a very short period of time. Aside from its skin lightening benefits, I also did notice that my pores look more refined. As for the remaining skin benefits which the product claims, sadly, I didn't notice much changes on those areas as my pigmentation seems to remain as a main stay on my skin and my overall skin texture remained the same as well. However, one thing to note is that this product does contain alcohol and on my combination skin, I do find that it can be slightly drying if I don't follow up with a good moisturiser or if my skin is off balance during some of my bad skin days. Otherwise, it works pretty well almost all the time. Hence, if you are one of those people with pretty dry/flaky skin, I would recommend to request for small samples from Kose's makeup counter before jumping on the band wagon. Overall, I think that this is a pretty decent product if you are looking for an effective skin lightening product and have not much concerns with regards to skin care products with alcohol. Kose Sekkisei Lotion is retailed at S$82 (200mL) in Singapore and can be found at all Kose counters or Sephora outlets. So you have stopped using SK2 treatment essence? Nope, I am still loyally using the SKII treatment essence as a pre-essence after toner..
Great article, thanks for it! Do I have to use anything else other than this toner to get the lightening effect?